Madison, the capital of Wisconsin, is also the second largest city in the state with a population of over 240,000 people. The metropolitan area of Madison is much larger, and has an estimated 568, 593 residents. You can always find something to do in Madison, even in the middle of winter. In fact, winter is one of the best times to visit Madison, but you can’t go wrong any time of year. There are plenty of events hosted by the school, including very big sporting events. If school events or college sports aren’t your thing, the city plays host to many other special occasions and happenings. 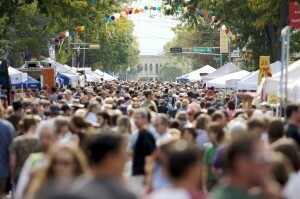 Some of the annual events include the Farmers’ Market, the Great Taste of the Midwest Craft Beer Festival, Rhythm and Booms, events on State Street, Waterfront Festival, Willy St. Fair, Atwood Summerfest, Fruit Fest, National Women’s Music Festival, many more music and cultural festivals in the various parks, and plenty of winter outdoor activities, such as ice-boating, ice skating, hockey, fishing, cross-country skiing, snowkiting, and much more. This is just a small sample of some of the many fun activities and events available to people of the Greater Madison area. With so many events in one great city, you want to separate your event from all the others. One of the best ways to do this is by renting a mobile Jumbotron screen. These large Megatron LED screens provide a great experience to all your guests, and make them feel like they are right next to the action, no matter where they are. It makes the overall event seem larger than life, and will keep them talking about it long after the event ends. It is also ideal for sponsors, because they will love the extra that they will get on the big screen. They can display their message to the entire audience, and it will keep them returning as sponsors year after year. Whatever you want to display on the Gigatron screen, we can make it happen and show your message to the crowd. This is what will separate your event from all the others. 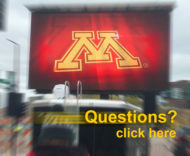 If you are planning or organizing an event in Madison or anywhere else in the Wisconsin or Midwest area, you may want to consider a Fire Up Video mobile screen rental. We also serve the states of Minnesota, North Dakota, South Dakota, Nebraska, Iowa, Illinois, Ohio, Indiana, Kentucky, Kansas, Tennessee, Colorado, Nebraska, Michigna, and Missouri. If you are interested or have any questions, please contact us at 844-533-8848 or baum3@earthlink.net.